Cool, fall days are coming and it’s time for some comfort food. 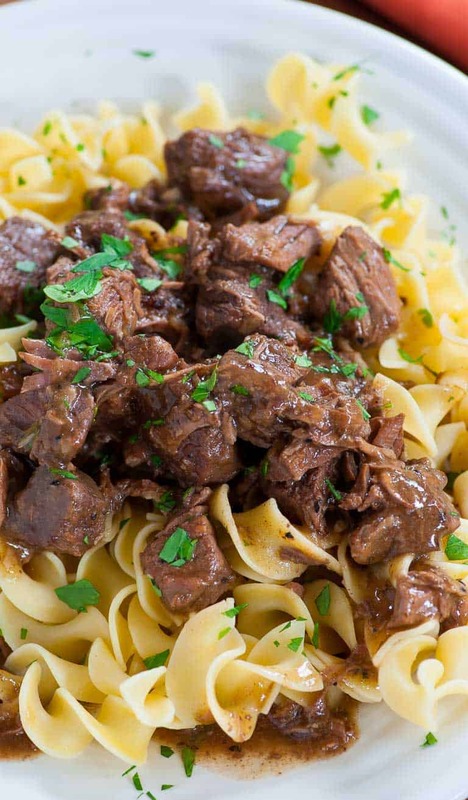 Tender beef tips on egg noodles fills the bill. Using beef stew meat and simmering it for a few hours makes it tender and succulent. Perfect for a fall evening. 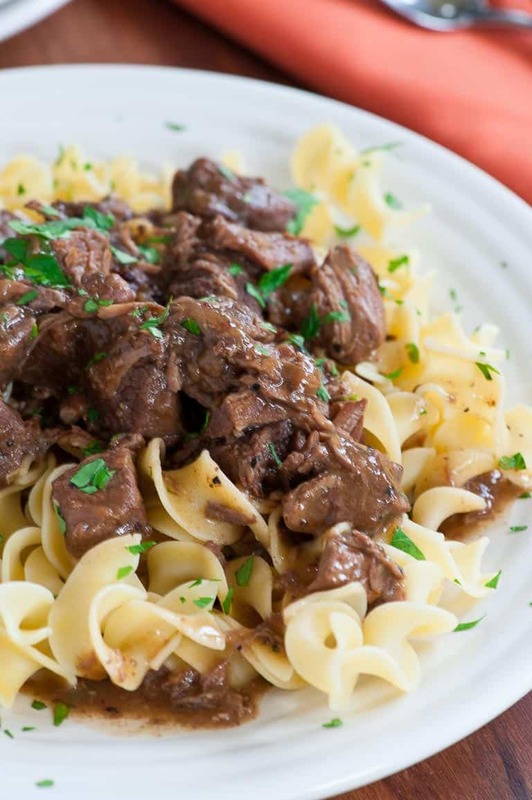 This tender beef tips recipe is somewhat similar to beef stroganoff without the extra calories of sour cream. But this doesn’t mean that it lacks in flavor. 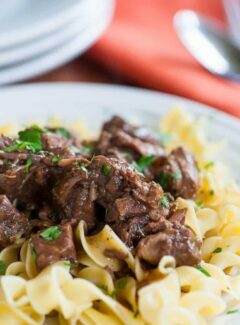 I used beef stew meat for this, which is a tough cut of meat, but when simmered in red wine, soy sauce and worcestershire sauce for a few hours, turns into a tender, flavorful main dish you can serve over noodles. You could also have it over mashed potatoes or rice, whatever you prefer. I cooked the meat in a large cast iron dutch oven. I browned the meat which takes 4 or 5 minutes, then added the onion and garlic. I cooked the onion about 3 minutes to soften. The stew meat gives off quite a bit of liquid when it’s browning, but just leave that in the pot, then add the other liquids and pepper. Go turn on a Netflix movie and let the pot simmer for a couple hours. I watched “The Firm” while waiting, checking every 20 to 30 minutes to see how it was coming. To thicken the gravy, it’s best to have a cool liquid in which you dissolve the flour. 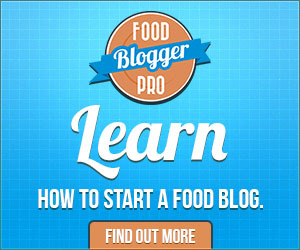 It you use hot liquid, the flour will clump and you don’t want that. Add the flour mixture back into the pot, bring to a boil and let the gravy thicken. Serve the tender beef tips over egg noodles with a nice salad or vegetable on the side. This is comfort food to the max…perfect for a fall meal. Beef stew meat that is simmered with red wine, soy sauce and Worcestershire sauce. Made into a gravy served over egg noodles or even mashed potatoes or rice. 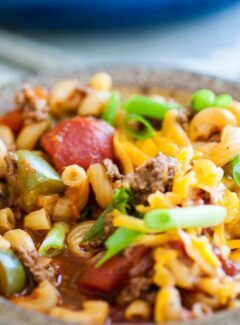 Place vegetable oil in a dutch oven or large stock pot and heat on high, add the beef and cook stirring until browned 3 to 5 minutes. Add the chopped onion, garlic and black pepper and cook, stirring for 2 or 3 more minutes to soften the onion. Next, add the liquid ingredients, bring to a boil, then reduce the heat to a simmer, cover and cook for 2 to 2 1/2 hours. Remove a cup of the liquid after two hours and place in the refrigerator to cool, about 30 minutes. Once the liquid is cooled add 3 tbsp flour and whisk to dissolve. Add the flour mixture to the pot and whisk to incorporate. Bring to a slight boil then let the broth thicken for 10 to 15 minutes while simmering. While the broth is thickening, boil the egg noodles per package directions, drain and keep warm. 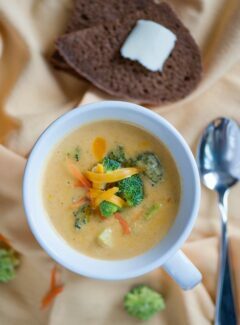 This was perfect with a glass of red wine, broccoli, and really good bread (and butter, of course). The aroma was so wonderful while it was simmering that we could hardly wait to eat! I’m ready to make it again!